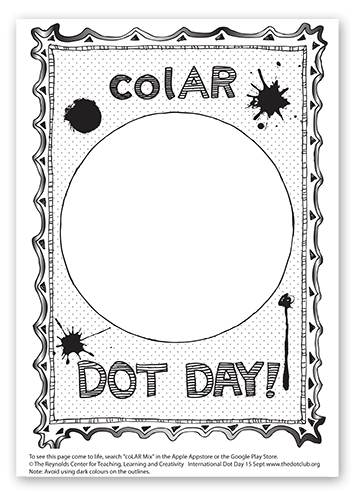 Print this PDF and have fun coloring your dot. Make your mark — make it your own, unique creation! Install the colAR app on your mobile device. The app is now available for free on the Apple App Store and the Google Play Store. Open the colAR app on your device. Hold your device over the colored page to view it on your device screen (as if you are about to take a photo of it). When you are holding your device in exactly the right position above the page, the page will look blue on your screen. Your dot will come to life! Click the little purple icon at the bottom of the screen to switch between different 3D views — watch your dot pop up off the page, become a dot galaxy... and more! You can tilt your device to admire your dot from different angles. Please consider sharing a screenshot or photo of your dot at the Dot Day Facebook page or on Twitter with #DotDay and @DotClubConnect. We'd love to see what you're creating! For more information about colAR, check out Puteko's official website. Questions? Please contact the colAR team and they will be happy to help you! The School District of Palm Beach County is Celebrating Dot Day District-Wide!